After years of hearing that the Vertical Mouse is a little too big for some, Evoluent has made the New VM4 Version in a Smaller type. This new version is about 10% smaller. 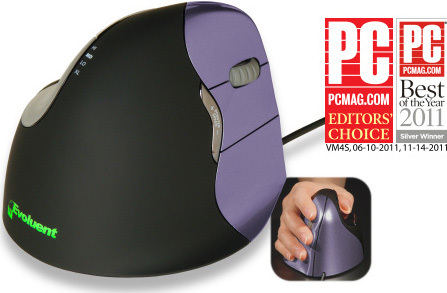 Since it is basically geared towards a woman`s hand that is smaller, the mouse has the original Purple Color for the buttons in front. 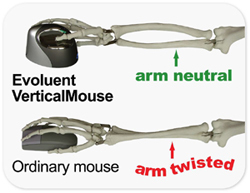 The Evoluent VerticalMouse 4 Small is for hands less than about 7 inches or 178 mm long from the tip of the middle finger to the wrist crease. 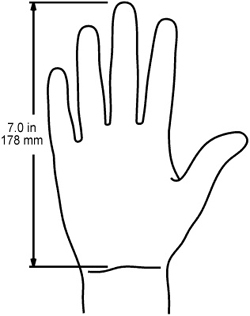 If your hand is the same size or smaller than the below drawing, VM4S may fit you better than the regular VM4R. Includes driver for Windows XP, Vista and Win 7, 8, and 10 in 32/64 bit for programming all 6 buttons. The driver is not required. The VerticalMouse 4 still has basic functionality without it.